Do you remember when you were a child and you had that one little thing that was only yours and you didn’t really like to share it? Or maybe a rabbit’s foot, a new shiny coin that you were reluctant to spend, or those special scented stickers or pencils that always seemed to disappear when you finally got one? My little sister always cherished the little, tiny pebbles from the gravel driveway that were kind of marbled white, ivory, or very tannish peach in color. She would spend hours picking them out to collect them as her “treasure” because they were so pretty compared to the normal, every day, reds and browns of gravel color. And she really did treasure them. 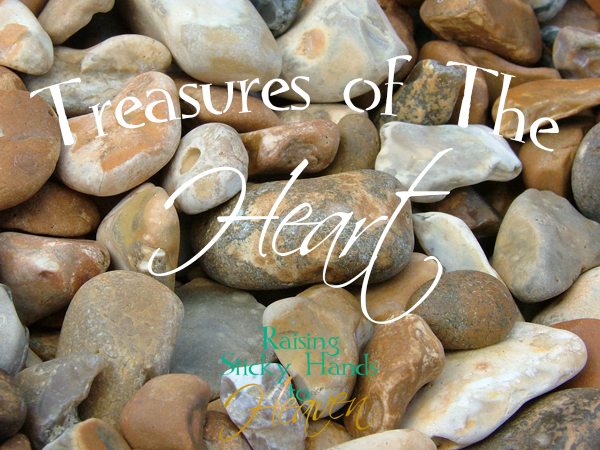 There were times when she and a cousin would fight over who would get to keep those treasured pieces of rock. My family is a treasure to me. A treasure that I truly value. We are living in a day where many people have thrown family values out the window. They have taken the Cay Sera Sera mentality of “whatever will be, will be”. They don’t treasure others anymore and they sure don’t treasure that we have a loving God, who is ready and there for us to call upon at any given moment. As much as it saddens me to see so many take this approach, we can not fathom the pain that it must cause our Heavenly Father. To see things gone amuck from the way it’s supposed to be. People simply do not care about other people, nor do they treasure the gift of life in general. We are a treasure in God’s eyes. He sees each of us as unique individuals, created in His image. His word tells us that He is a jealous God. He doesn’t want to share you with the cares of this world or with the devil. He wants you to turn your eyes upon Him for every need, every care, every doubt, every praise, to love, to worship, to adore, to treasure! Take a moment to search your heart. What do you treasure there? Is your heart set on things above or the things of this world?